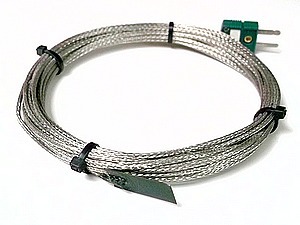 Type K Leaf Thermocouple for measuring surface temperatures. A 25 x 13 x 0.3mm brass strip with the thermocouple junction attached. 5m of stainless steel over-braided fibre glass insulated lead, terminated in a mini plug.